A few days ago I was in my element – after grocery shopping in my favorite Kroger, I visited the Starbucks in the front of the store. I still can’t believe they built one of my greatest loves inside one of my other greatest loves. Sigh. God loves me. The workers all know me – how could they not, they see me daily? However, this particular day found me face to face with a newbie. I felt like a major league baseball player staring intimidatingly at a rookie pitcher on the mound….. Go ahead, impress me. The new guy was adorable – probably all of 17 years old, if not younger. He sensed my Starbucks guru status, so he was a little nervous. Who could blame him? I went easy on him (I thought) and ordered a Passion Tea Lemonade. Passion Tea Lemonade and summer were made for one another – if you’ve never tried it before, you HAVE to as soon as possible. As luck would have it for the new kid on the clock, he found the lemonade container empty. He looked around nervously and even picked up a walkie talkie looking thing like he was going to call for back up. I purred, “It’s okay, honey, I can just take it straight.” We call everyone honey in the south. In the parking log, I took a sip. Then another. Then another. I had planned to bring the drink home and photograph it for a tea review on the blog. 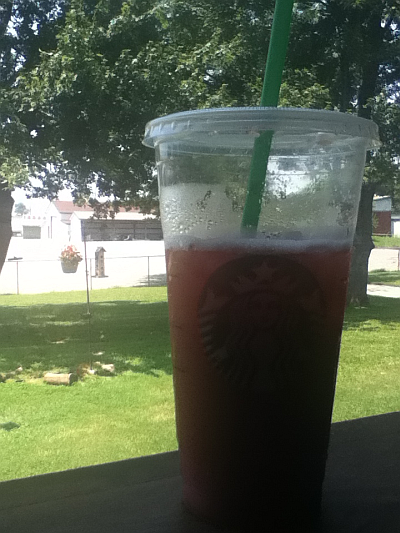 I mean, in more proof of God’s love for me, we live within 3 minutes of Kroger/Starbucks. As you can see from the picture above, the exceptional tea nearly didn’t make it. I’m pretty sure I’ll order it this way from now on. It was so amazing – with all the strawberry flavor of a smoothie, without all the calories. Try it, you’ll want to marry it. Previous Post: « In a shocking twist, green tea is still good for you.